Prophecy of Birth: His father, Sultan Ibrahim (رحمتہ اللہ علیہ) married with Bibi Khadija Begam (رحمتہ اللہ علیہ) at the age of twenty five years. He had only two or three daughters and no son, After the birth of daughters, there was no issue up to eight years. He was grieved at heart. One morning, he and his wife Bibi Khadija Begum (رحمتہ اللہ علیہ) were sitting together on Musallah (Carper for saying prayer) All of a sudden Hazrat Ibrahim Mazzoob (رحمتہ اللہ علیہ) entered in to the palace. Both were astonished to see him. Hazrat Sultan Ibrahim (رحمتہ اللہ علیہ) stood up and went forward to greet him. He made him sit on the throne and both husband and wife were standing bending their heads before him . Seeing such a noble courtesy meted out to him, he said “ Probably you are desirous of son ”. Hearing it both were extremely glad and said, “ It will be our good luck if you bestow a son ”Ibrahim Mazzoob (رحمتہ اللہ علیہ) again said, “It's price is very much as I will give you an extra ordinary thing” . Sultan Ibrahim (رحمتہ اللہ علیہ) readily said, “whatever you order, I am ready to fulfill it .” Ibrahim Mazzoob (رحمتہ اللہ علیہ) said, “I want one thousand Dinar.” Sultan Ibrahim (رحمتہ اللہ علیہ) presented one thoudand dinar before him. Ibrahim, Mazzoob (رحمتہ اللہ علیہ) stood up happily and said, “O Ibrahim (To Himself) you gave hawk (baz) to Sultan Ibrahim and he bought it cheap. ” Hazrat Sultan Ibrahim (رحمتہ اللہ علیہ) went forward with him as a respect. Turning back, Ibrahim Mazzoob (رحمتہ اللہ علیہ) saw him and said, “ What do you want more; you have got your son.” It is also narrated that one night Hazrat Mohammad Mustafa (صلى الله عليه وسلم) came in his dream and predicted that a Waliullah (Friend of Allah) was to be born in his house; His name will be Syed Ashraf. The will of Allah placed the Kingly crown on his head. It is a historical fact that he continued discharging affairs of state with full responsibility but he was instinctively inclined to mysticism and soluk (way to Allah) He often passed his time in the company of holy person of spirituality and sought knowledge about suluk and Marfat (revelation) He felt disgusted with the affairs of state. The fire of excessive love of Allah which was burning in his heart began to increase excessively resulting hate and disgust. with the affairs of kingdom . When he was 23 years old, he dreamt Hazrat Owais Qarnee (رحمتہ اللہ علیہ) who educated him Azkare Owaisia (remembrance of Owaisia) without using tongue. He remained minutely engrossed in the Azkare Owaisia for three years as a result of which the hidden fire of love of Allah turned in to blaze and burnt his self. At this stage, he seldom attended the kingly court thinking it to be of no value and use for him, At last, the desired day came and Hazrat Khidir (Alaihissalam) appeared again before him and said, “ O Ashraf, the purpose for which you have come in this world is before you; desert the worldly throne and leave for Indian where Shaikh Alaul Haque Ganje Nabat is anxiously waiting for your in Pandwa, Bengal." 17. After performing Faraezo wajebat (Divine command and obligatory) it is essential for seeker of spirituality to pass his valuable life in the company of holy persons as only one meeting with such persons is so much useful that can't be gained by a number of chillah (sitting in meditation for fourty day) and vigorous Mojaheda (Great struggle). 18. A slave (Banda) should pray and merciful (Karim) is worthy of kindness; one should be so engrossed in his prayer that he should forget one's existence. (2) Once a woman, taking his half dead son, came to his Khanquah (an abode for holy man) and entreated with tearful eyes to pray for his life. In the meantime, the boy took his last breath and died before him. She began to weep bitterly and said with folded hands. You are Allahs friend (Waliulah); Bring my son to life.” He said , “ life and death is in the hand of Allah; what a slave (Banda) can do.” Hearing it , the ill-fated woman started weeping with such mournful voice that his heart filled with pity and an astonishing condition prevailed on his face. Solacing the grieved woman , Hazrat Makhdoom Simnani (رحمتہ اللہ علیہ) said in full eminence (Jalal), "I give ten years from my life and after ten years this boy will die.” He prayed to Allah for his life and ordered the dead boy to stand up in the name of Allah . The dead boy stood up and got life for ten years. Truely he died after ten years. 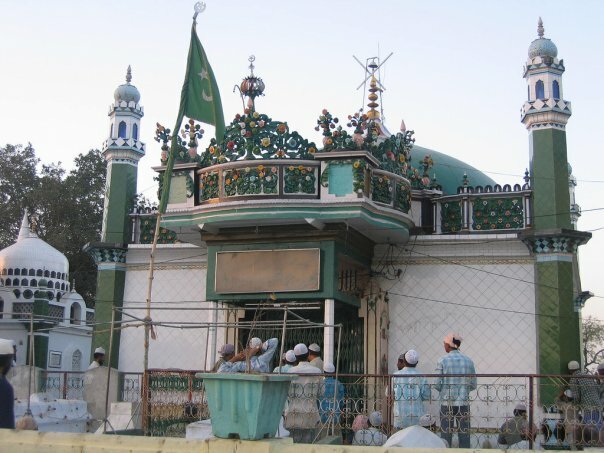 Urs of Hazrat Sultan Syed Ashraf Makhdoom Simnani (رحمتہ اللہ علیہ)takes place in the Khanquahe Ashrafia Hasania Sarkare kalan with great pomp and show. Piligrims from different parts of India and abroad come in large number by road, by train and by plane. Khanqahe Ashrafia Hasania Sarkare kalan looks packed to the capacity. No place is left where there is no piligrims. All around the shrine of Hazrat Makhdoom Simnani (رحمتہ اللہ علیہ) sea of human beings irrespective of caste and creeds appear chanting ya Makhdoom. All followers of Khanqahe Ashrafia Hasania are provided meals in their rooms from the night of 26th Moharram up to day of 29th Moharram. Hazrat Sajjadah Nashin supervises the management of Urs with great care in order to provide all amenities to the pilgrims of Hazrat Makhdoom Simnani (رحمتہ اللہ علیہ). Everyone is impressed to see hospitability and sincerity. The programme of Urse Makhdoomi is scheduled and well organized. Every programme is held according to the customs and time fixed for it. b) Khatme Bukhari Sharif at Maulana Ahmad Ashraf Hall after Asr by Hazrat Sajjadah Nashin. c) Halqai Zikr after Maghrib at Ala Hazrat Ashrafi Masjid by Hazrat Sajjadah Nashin. d) Mehfil-e-Sama (Qawwali) after isha prayer. a) Mehfil-e-Sama (Qawwali) from 10 am to 1.p.m. b) Procession of Moe Mubarak from Kichowcha sharif at 2.30 p.m It reaches in the Khanqah at 4 p.m.
c) Ziyarat of Moe Mubarak by Hazrat Sajjadah Nashin in the ground of Khanqah. d) Function of Dastare Fazilat after Isha prayer and speeches by eminent learned man takes place. a) Mehfil-e-Sama (Qawwali) from 10 a.m. to 1 p.m.
b) Procession of Lebas-e-Ghousia from Kichowcha Sharif to Khanqah-e-Ashrafia Hasania with Hazrat Sajjadah Nashin sitting in Palanquin with Lebas-e-Gausia. It reaches to Khanquah at 4 p.m.
c) Hazrat Sajjadah Nashin puts on Khirqah (patched garments) and after procession starts where piligrims see him in Khirqah (patched garments) with due respect. Qul and Fateha take place. In the last Wali Ahad Janashin reads Shijrah (Pedigree) and prays to Allah with the intercession of Hazrat Makhdoom Ashraf Jahangir Simnani (رحمتہ اللہ علیہ) with tearful eyes for all pilgrims in such an effective manner that everyone weeps. d) Mehfil-e-Sama (Qawwali) after isha prayer throughout night is held. a) Last Qul and Fateha in the old hall of Sajjadah Nashin. b) Mehfil-e-Sama (Qawwali) for one hour and ends with the pray of Hazrat Sajjadah Nashin.